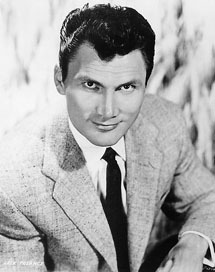 Jack Palance was a handsome yet ferocious-looking actor who usually played savage thugs or tough-as-nails cops. His breathless, staccato style of speaking added to his intimidating presence. He appeared in about 90 movies, stealing scenes in supporting roles and carrying films in leading roles. American audiences knew him as "Joker" Jack Nicholson's doomed sidekick in Batman, as the cartoonish heavy in Stallone and Russell's Tango & Cash, and as the aging bad guy in the Gen-X western Young Guns. In City Slickers, he spoofed his tough image, leading Billy Crystal and Daniel Stern on a cattle drive. Born Vladimir Palahnuik to Ukranian immigrants, he called himself Walter Jack Palance to keep from being teased. As a young man, he was a professional boxer, which explains his rippled nose. He served in the Army Air Force during World War II, and required facial reconstruction after the B-24 bomber he was flying crashed while patrolling the coast of California. While he was a struggling actor, he worked as a short-order cook, soda jerk, and lifeguard. He understudied Marlon Brando in the original Broadway production of A Streetcar Named Desire, and Brando invited Palance to work out with him in the theater's basement. The actors were pounding a punching bag when Palance missed the bag and splattered Brando's nose. Brando was taken to a hospital for medical attention, while Palance took the stage in the lead, and his performance drew a contract offer from 20th Century Fox. Palance always maintained that making his own "big break" was an accident. In his first film, Panic in the Streets (1950) with Richard Widmark, he played a killer infected with bubonic plague. In Shane with Alan Ladd, he played a cold-hearted gunfighter. In the classic Sudden Fear with Joan Crawford, he played her murderous husband. He starred in the '50s noir classic I Died A Thousand Times with Shelley Winters and Lon Chaney, Jr., and in the wild western The Professionals, he played "the bloodiest cutthroat in Mexico", alongside macho men Burt Lancaster, Lee Marvin, Robert Ryan, and Woody Strode. He played Attila the Hun in Sign of the Pagan. And in a near-forgotten gem from 1955, The Big Knife with Ida Lupino, he played a movie star who wanted to leave Hollywood and make more highbrow, artistic films. That was Palance, too. He often took work in Europe, where he could play roles unavailable to him in Hollywood, and work unfettered by his American movie-star image. In the spaghetti western Companeros, he played a sadistic one-handed pot-smoker. In 1959's Beyond All Limits, he played a shrimp fisherman, and delivered his lines in Spanish. He played Fidel Castro in Che!, and may have done his best work in Jean-Luc Godard's tragedy Contempt. He also excelled as the grizzled WWII hero in Attack with Eddie Albert and Lee Marvin. In Robert Aldrich's Ten Seconds to Hell, he played a former German soldier working in a bomb squad. In Baghdad Caf�, Palance played a creatively stifled painter in the middle of nowhere. With his mean demeanor, he was the studio's first choice to play the Klingon Commander in Star Trek VI: The Undiscovered Country, but Palance had to decline, as the filming schedule conflicted with City Slickers. At the next year's Oscars ceremony, where he won the Best Supporting Actor statue for City Slickers, Palance performed several one-handed push-ups, just to show that he could. On TV, he joined the circus in The Greatest Show on Earth, played the detective Bronk, and hosted Ripley's Believe It or Not! for several years. He once fell asleep and began snoring in his square on The Hollywood Squares. Palance lived his last years on his ranch in rural California, and also owned a farm in Hazleton, Pennsylvania. His daughter Brooke is married to Michael Wilding Jr., son of Elizabeth Taylor. Emmy 1957 for Playhouse 90 "Requiem for a Heavyweight"